Last week we covered the 6 Most Pervasive Bed Bug Myths that do more harm than good. Today, we’ll be talking about the other side of the same coin – Bed Bug Treatment Myths that have left people with harmful chemicals in their lungs and burnt down houses. On the more mild side of the spectrum, you could just end up making your infestation worse or indefinite. Read on and ensure you don’t become another victim! Foggers are marketed as convenient indoor-safe bombs that supposedly kill and repel any bug they come into contact with. Truthfully, they’re worse than doing nothing. After finding a bed bug or some undeniable signs of the pest, it’s natural to want to go to the hardware store and pick up any product with a picture of bed bugs on it. 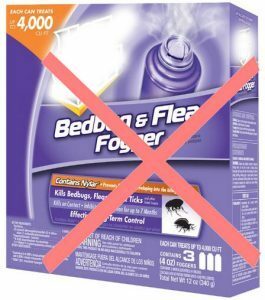 Unfortunately, foggers serve as nothing more than bed bug repellent at best…which is a bad thing! Let me explain. Pyrethroids are typically the dominant pesticide found in foggers; they do a good job when applied properly, but only perform their magic when applied directly. This makes them effective in sprays and powders, but completely ineffective when it comes to foggers. Rather than killing the bugs, foggers drive them deep into your home. What started as a surface-level infestation of your bed quickly seeps into nooks and crannies and the very foundation of your place of residence. 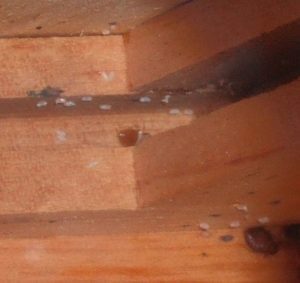 Bed bugs hiding amongst wooden supports. Adults try to lay eggs in safe hideaways. Bed bugs are hide-and-seek masters; foggers do a great job of kicking their hiding instincts into high-gear. Rather than reach for a fogger at the hardware store, go to a bed ware store and pick up an encasement EXPLICITLY DESIGNED for bed bugs and consider applying Diatomaceous Earth if you’re desperate to do something today. Bed bug encasements are such a big deal that I’ve written a dedicated guide to choosing one. Not all encasements are effective! What I recommend, however, is that you hunker down and plan for war. Fill out your Integrated Pest Management plan and keep the advantage of an element of surprise for the potent stuff once it comes in the mail. Bed bugs aren’t defeated with luck or random purchases at the first store you get to. An IPM is the absolute best weapon you have against them. It’s a downright necessity. For more, check out The Ineffectiveness of Foggers Against the Bed Bug by researchers from Ohio State University. Rubbing alcohol and isopropyl alcohol are one of the first suggestions DIY’ers tend to bring up. While bed bugs will die from exposure to high concentrations of alcohol, you take on a lot of risks as a consequence. Stained sheets and furniture and the real concern of fire top the list of these threats. The big fires you see in the news now and then “caused by bed bugs” tend to be caused by rubbing alcohol accidents or attempts at self-prescribed whole-house heat treatment. Alcohol solutions need to be applied directly to bed bugs to kill. They also need to be concentrated at 90% or higher to kill. This means that you have to either be in an advanced stage of infestation where you can actively find them, or, you’ll have to soak everything you think might be infested with highly flammable liquid. Bed bug eggs hidden away are another issue – they will not be affected by random spraying whatsoever. For actual results, you’re much better off relying on sprays meant for bed bugs specifically. For a completely natural solution that kills on contact, nothing can beat hot and deadly steamers. In the case of an advanced infestation, you’ll struggle if you don’t have your IPM in full-swing. Killing a handful of bed bugs won’t change the greater situation at all. Evaluation of Two Least Toxic Integrated Pest Management Programs for Managing Bed Bugs by researchers from Purdue University covers alcohol as a solution more thoroughly. This should be Number 1 on the list as it’s so dangerous and common. It is the best way to lose your house and endanger your neighbors, and the worst way to try getting rid of bed bugs. Imagine the same ineffective results you get with foggers, only with an infinitely greater chance of lighting your home on fire. Bed bugs don’t like heat. They tend to start dropping dead at around 115˚F although experts will recommend you reach 120˚F to get rid of the hearty outliers. Attempting to heat an entire room down to the foundation up to 120˚F is ludicrous on the surface. The worst part is that it wouldn’t work. When using a purpose-made bed bug heater, thermal monitors should be used to ensure that everything reaches temperatures exceeding 120˚F even in a small container. How would one monitor the temperature of an entire room? Realize that bed bugs have legs and would rather move deeper into your floors or into other rooms rather than die. You’d have to heat your entire house to have a real effect while monitoring every nook and cranny. This is what makes whole-house heat treatment a job for the professionals. I’ll cover alternatives anyone can take advantage of in #4. When it comes to the car oven solution, your chances are looking a little better. This is when people pack bags full of items to be treated into trash bags or simply pile them in and hope for a hot day to do the work. Cars can hit that temperature sweet-spot, but there are a few factors to consider. First, there are sweet spots in your car that bed bugs can hide away in. Squeezing between cushions and into very thin spaces is a patently bed bug move. Second, you’re voluntarily introducing bed bugs into your car. Do you want to be a bed bug taxi? This would make it happen. Finally, it is not a reliable process. Use a few thermal stickers or probes to check the top temperature of a few hiding spots you can imagine bed bugs squeezing into. You’ll find inconsistency depending on the day, season, and level of insulation. The better and more reliable solution is to throw what you can into the laundry dryer machine set to “High”…if it’ll fit and not be damaged by the process, of course. Haphazardly spraying pesticides without educating yourself about their effects, proper application, and the safety measures you need to take is asking for trouble. Plain and simple, please do your research before voluntarily exposing yourself to mystery chemicals. It’s easy to react instinctively, but your long-term health is more important than relief today. Bed bugs are horrible, but they are not deadly, unlike acute exposure to some pesticides. I advocate the use of protective pesticide gear every day of the week and hope it comes through that my concern is your health above all else. Utilize indoor-use pesticides responsibly for yourself and your house mates. Plenty of websites, videos, and people on forums will confidently tell you that Diatomaceous Earth is the answer to all your wishes and troubles. It’s cheap, it’s natural, it’s harmless to people and pets, and it just works – or so it is said. In reality, the professional and scholarly community has been moving away from the stuff at a quick pace. Diatomaceous Earth works great in the lab but poorly in the real world. It’s especially effective on bugs that are prone to water loss like slugs, crickets, or larvae as they’re wriggling around without strong carapaces. Unfortunately for us, bed bugs have a seriously tough carapace that resists even concerted efforts to squish them. Their lifecycle of ceaselessly molting once a week means that should the DE not kill within those 7 days, a newly molted bed bug will emerge free of DE. Even worse is the fact that powders and dusts act as repellants to bed bugs. You can fool them once or twice, but they certainly won’t be bathing in the stuff, which is what DE really needs to work. For better natural dusty alternatives, look to solutions with Amorphous Silica like the natural CimeXa and Evergreen, or something synthetic but ultra potent like Drione. DE works better than nothing and will discourage bed bugs from certain zones, but, as with any other solution, it should be no more than a cog in the machine of your master Integrated Pest Management plan. I’ve harped on this before in the section “What Not To Do” in the Get Rid Of Bed Bugs Page, but it’s important to drive this one home. Not only do you risk spreading bed bugs to your entire complex should you improperly dispose of it on the sidewalk, throwing away your mattress is very unlikely to solve your problem. You’d also have to toss the box spring and would have to buy a new bed set entirely. That new one will probably get reinfected if you’re part of the majority of people whose bed bug population isn’t 100% concentrated in the bed. Instead, secure your mattress with the help of this practical guide. If you know there are bed bugs in your mattress, there are steps you can take right now to stop bed bug bites. An encasement, bed leg interceptors, and some simple decor rearrangement will make a huge difference in your quality of life. While it seems like an easy and obvious solution on the surface, starving out bed bugs is a fool’s errand. In the primer on bed bugs, I brought up their insanely frustrating ability to survive without a meal for over a year. Even young bed bugs are capable of surviving several months without feeding. There are plenty of horror stories involving summer homes and their unwitting owners’ surprise when the bugs they suffered through last year haven’t left 365 days later. With that in mind, some might conclude that they have no problem sleeping on the couch for a year-and-change. One of the worst things you can do is migrate from your bed to the couch. That’s how you spread the love and move victory further from yourself. In spite of the name, bed bugs hold no particular loyalty to your bed. They’re just as happy living in a couch, under chairs, between floorboards, and wherever else they might be able to squeeze into with their tiny bodies to lay their tinier eggs. For a good night’s rest, the solution is still to invest in a proven mattress box spring encasements and a set of bed leg traps. Make your bed a haven to get some real rest and drastically cut down your number of bites. As with the last post on bed bug myths, please reach out with any suggestions I missed or with any corrections. Sometimes, waiting and planning is better than doing. We as humans sometimes have issues accepting that, but it’s especially true when it comes to bed bugs. Take the time to craft your IPM and read the page on Bed Bug Treatment in preparation. The knowledge you gain will be your most lethal weapon giving you best chance at a swift and decisive victory. Next on your list should be Preventing Bed Bugs. It’s never done, huh?